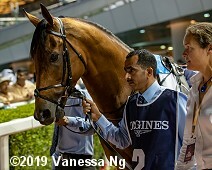 The $6 million Longines Dubai Sheema Classic (G1) is the last of four scheduled turf races held on Dubai World Cup night. A field of 8 older horses went 2410 meters (about 1 1/2 miles), one complete circuit of the expansive turf oval at Meydan Racecourse in Dubai. 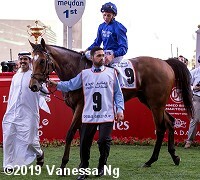 Old Persian was sent off as the 8-5 favorite off his win in the Dubai City of Gold (G2), the main local prep for the Sheema after finishing 5th in the St Leger (G1). In to challenge him included 2-1 second choice Rey de Oro, winner of the Tenno Sho Autumn (G1) before finishing a close second in the Arima Kinen Grand Prix (G1), and 3-1 third choice Magic Wand, 4th in the Breeders' Cup Filly and Mare Turf (G1) then 2nd in Pegasus World Cup Turf (G1). 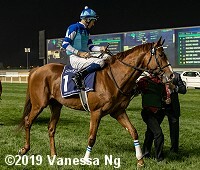 Jockey Christophe Lemaire sent Rey de Oro to the lead first time by through easy fractions of 26.90, 50.59, 1:14.81, 1:39.54, and 2:04.15 while pressed by Magic Wand and stalked by Old Persian and Hunting Horn. At the top of the lane Rey de Oro tired as jockey William Buick sent Old Persian to the front through 11f in 2:15.55. 11-1 Cheval Grand, well back early, put in a strong late rally under Hugh Bowman but Old Persian easily held him off by 1 1/2 lengths in 2:27.17. It was another 1/2 length back to late-running 9-1 Suave Richard third. Left: Old Persian in the winner's enclosure. 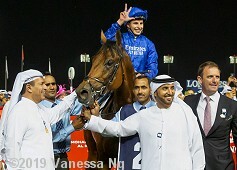 Winning trainer Charlie Appleby said, "It has just been a fantastic night, and I'm so pleased for His Highness Sheikh Mohammed and the whole Godolphin team. They went a good sensible gallop and William made a sensible move turning for home to make his gap, allowing himself to get the run he needed. I knew the acceleration was there." Right: Old Persian parades with his winner's blanket. 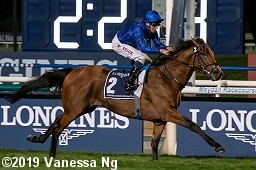 Apppleby added, "He's a class animal, a typical Dubawi who has made that great progression." Left: The trophy presentation for the Sheema Classic. 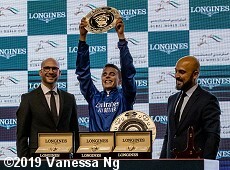 Winning jockey William Buick said, "Coming here tonight, we knew we had exceptional horses in good shape, but with the international competition, it can sometimes be hard to weigh up. Especially in this race, the Sheema Classic, you had to give respect to the Japanese and to Aidan O'Brien's horse. It was a big effort." 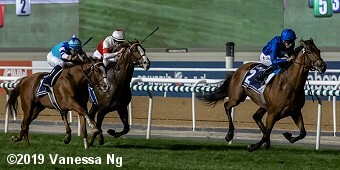 Right: The horses break from the gate for the Sheema Classic. Left: Old Persian in the walking ring. 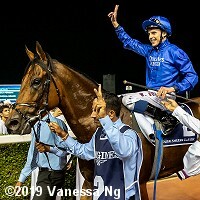 Winning jockey William Buick said, "He got a lovely trip around and, even when Christophe slackened the pace about halfway, we were in a good spot. It was just a question of getting the splits. I have to give credit to the horse - he finds his own passage and, from three to four, he's really improved and he has a big turn of foot now. It was a beautiful performance from the horse. " Right: Old Persian behind the starting gate. 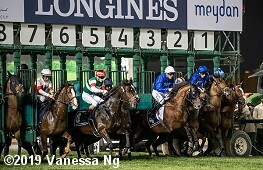 Left: Second place finisher Cheval Grand behind the starting gate. Jockey Hugh Bowman said, "He's a very consistent horse. He was a bit slow to jump, which I didn't want to happen, but I was pleased with where I settled. I thought the pace was quite strong early, it slowed up in the middle stages but it wasn't a joke. It was a bit of a sprint home, which played into the winner's hands, but my bloke ran his heart out and I'm very proud of him. 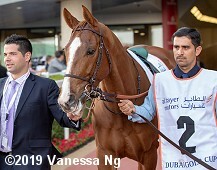 It's been a great first experience riding at Meydan, but obviously it would have been nice to win." Right: Third place finisher Suave Richard returns after the race. 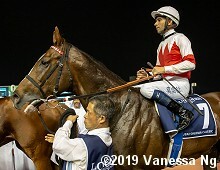 Jockey Joao Moreira said, "He had a beautiful run through, they were going fast enough that I knew the front runner wasn't going to be in the first three horses. I got a held up a little bit when the horse in front of me started to drop back around the 1000m mark, and that may have cost me second place. There wasn't much I could have done differently. It was a good run." 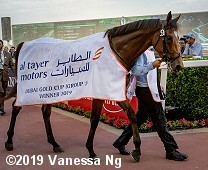 The $1.5 million Al Tayer Motors Dubai Gold Cup (G2) is the longest race on World Cup night, contested at 3200 meters (about 2 miles) on the turf. Melbourne Cup (G1) winner Cross Counter was sent off as the 3-2 favorite in the field of 10. 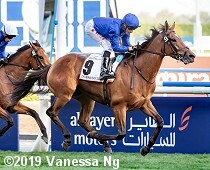 In to challenge him inluded 5-2 second choice Ispolini, winner of the Nad al Sheba Trophy (G3), the main local prep for the Gold Cup, and 3-1 third choice Call the Wind, 2nd in the Prix Darshaan after winning the Prix du Cadran (G1). Jockey Pat Cosgrave sent 30-1 Red Galileo to the lead first time by and he set easy fractions of 27.17, 52.28, 1:17.35, 1:42.40, 2:06.79, and 2:31.35 while pressed by 10-1 Prince of Arran and stalked by Cross Counter and 40-1 Team Talk. Turning for home, Red Galileo tired badly allowing Ispolini, 8th early under Brett Doyle to sweep to the front through 1 3/4 in 2:55.19. Jockey Charlie Appleby asked Cross Counter to challenge for the lead and he took over at the 1/8 pole, drawing off late to win by 1 1/4 lengths in 3:19.00. It was another 3 lengths back to late-running Call the Wind third. Left: Cross Counter in the winner's enclosure. Winning trainer Charlie Appleby said, "It was his first opportunity to run since Melbourne and he answered all the questions. William was put in a bit of a pocket in the race but you're actually never too worried when you're working with the nice horses and good jockeys we have. I'm delighted with the result, it's what tonight is all about and it's good to get the first one out of the way. I just spoke to His Highness and we said we'd let the dust settle before come up with a plan but we could maybe go for the Gold Cup. But we'll sit back and enjoy today before deciding where we go." Right: Cross Counter with his new winner's blanket. Winning jockey William Buick said, "I was always going to choose Cross Counter over Ispolini and it is great has he come out and won on his return. Cross Counter is a special horse for His Highness Sheikh Mohammed bin Rashid Al Maktoum and Godolphin. The pace was a bit stop-start and I was very happy with the way he travelled and he finished off well. It is a great effort when you consider he has been off since the Melbourne Cup.."
Left: Second place finisher Ispolini in the walking ring. Jockey Brett Doyle said, "He travelled strongly the whole way and gave me a great spin. The race turned into a sprint but I was happy with my position throughout and he stayed on well. 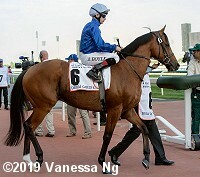 This was his first run over 3200m and given how well he travelled and the pace he showed - he may be better back over 2800m." Right: Third place finisher Call the Wind heads out to the track. 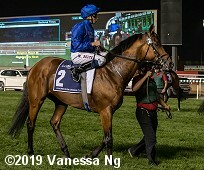 Trainer Freddy Head said, "They didn't go very quick at the beginning and when they quickened he was a bit outpaced and couldn't go with them. He finishes well though, but there is nothing to say. He is still young, he hasn't raced a lot. He probably would have prefered a better pace. He is still learning. He certainly hasn't lost anything in defeat." Jockey Aurelien Lemaitre added, "He ran very well. He was very relaxed. I was outpaced when they quickened. And then he stayed on. He is still a bit young in his head. He only ran the first time at the age of 4. He will be better with age." 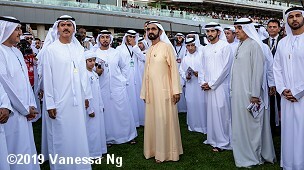 Sheikh Mohammed bin Rashid Al Maktoum and his entourage in the paddock after the Dubai Gold Cup waiting for Cross Counter to arrive.